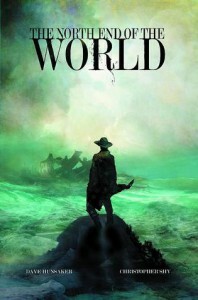 With its eerily drab still frames layered thick with historical grunge witch hoodoo, The North End of the World is a disturbingly beautifully dark piece of artwork that utilizes heavy mediums, strong shadows, visible brush strokes, and reminiscent of the late 1800 post-mortem pictures resulting in this oversized coffee table graphic novel. The overall agrestic look of this book vexes the mind immediately exposing all of the qualities of a psychological thriller. As one man takes it upon himself to document and preserve the stories of the natives, he soon finds out that evil is in abundance and his greatest fear is none other than himself.